There are a multitude of accessories on the market that are compatible with Apple iPads. 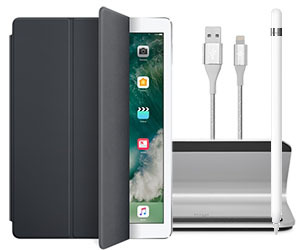 From protective Smart Covers to the Apple Pencil, which works with 9.7-inch and 12.9-inch iPad Pro models, Apple and third-party manufacturers have developed a wide range of supplemental accessories to enhance your iPad device. In addition to cases and stylus pens, accessory makers also have keyboards, screen protectors and docking stations to improve productivity and keep your tablet looking new.